The filling used is that for the dolmadakia: Here I used the most simple version and which does not require that the other cooking in the oven. Nothing prevents you to use alternatively the other version of the filling for dolmadakia. Here you will find the prescription. For convenience brought forth the ingredients for the filling (always better to have them all at your fingertips, before going tinkering in the kitchen ...), and, briefly, the procedure for preparing it. EVO oil to the pan q.s. cheese into small cubes q.s. Begin by preparing the filling that, by the use of raw rice, should be done then rest for at least half an hour to give time for the rice to soak in aromas and humidity. 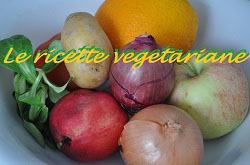 Coarsely chop the onion and the tomato and mix them in a bowl with spices and finely chopped herbs. Add the rice, mix well, gradually adding even wine. Let stand for at least thirty minutes. Wash the peppers, halve cutting them lengthwise and remove the white parts. Arrange them in a greased pan with a little oil, fill them with the un-drained filling, then pour a little vegetable stock into the pan without getting to cover the peppers: it will only take half a centimeter. Cover with aluminum foil and bake in preheated oven at 200 ° for an hour because the rice is used raw and not immersed in a liquid but only wet, it will take this time to achieve optimal cooking; as shown at the end. Distribute the cheese into small cubes raclette on peppers (maybe the feta or mozzarella - drained well, though) and go over again the pan in the oven, discovery, for about ten minutes. ... And get straight in the dishes: they are so complete, without further additions; but you can also accompany other dishes or serve as an appetizer. The sauce left in the pan can be added to the dish but, absolutely, should not be poured on the rice.